A bean gratin is quite satisfying for something so simple. Beans are fine fellows. Hearty, wholesome, humble. The old-kind humble – hard workers who sidestep the spotlight. As opposed to the new kind of humble. Now, every promotion, book deal and Oscar is met with #humble. Seriously? Do these overachievers own dictionaries? Humble and brag cancel each other out. The practitioner of actual humility might drop the hashtag, pick up a spoon and dig into bean gratin. 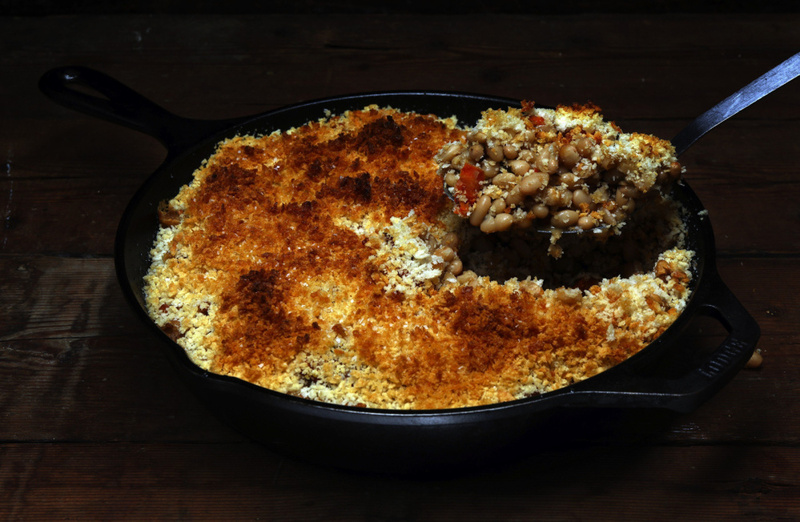 It’s a skillet of white beans, stewed with carrots and garlic, huddled under a breadcrumb crunch. Not fancy, but fantastically satisfying. Not that anyone else needs to know. Rinse and sort beans. Slide into a big pot. Cover with cold water by 2 inches. Cover pot and let beans soak overnight, or boil 1 minute, cover and let rest 1 hour. Drain and rinse. Heap beans in a big pot. Add 4 cups water, chicken broth and rosemary. Simmer, adding boiling water if needed to keep beans covered, until completely tender, about 2 hours. Slice the garlic bulb in half along its equator. Set on a double thickness of aluminum foil, cut-sides up. Drizzle with 1 tablespoon olive oil and sprinkle with 1/4 teaspoon salt. Close up the two halves, wrap the bulb in the foil. Roast in the oven at 400 degrees until completely soft, about 35 minutes. When cool enough to handle, gently squeeze one of the halves, popping the roasted garlic out of its skin. Mash with a fork. Set aside remaining garlic for another project. Heat 1 tablespoon olive oil in a skillet set over medium heat. Add carrots and fennel seeds. Cook until carrots turn tender, about 20 minutes. When beans are plump and tender, drain, reserving the cooking liquid. Discard rosemary sprig. Mash beans once or twice with the back of a fork, leaving most whole. Mix beans with carrots, salt, pepper and mashed garlic. Lightly brush a 10-inch cast-iron skillet with olive oil. Heap in beans. Pour in enough cooking liquid to almost – but not entirely – submerge beans. Cover with breadcrumbs. Sprinkle with salt, and drizzle with olive oil. Slide into a 400-degree oven, and bake until hot inside and crisp on top, about 30 minutes. Serve hot or warm.